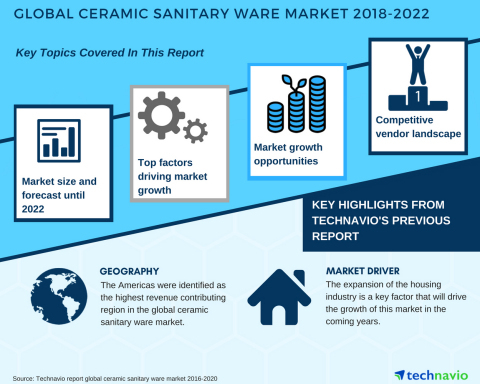 LONDON--(BUSINESS WIRE)--Market research firm Technavio has announced the release of their latest report on the global ceramic sanitary ware market. This new report will provide new insights based on an up-to-date analysis of the market for the period 2018-2022. The report will comprise extensive research on the market with regards to the current competitive landscape and the global environment. It will also provide new forecasts based on the prevalent market scenario. Technavio reports offer actionable insights for stakeholders in the industry. The upgraded research report on the global ceramic sanitary ware market 2018-2022 is an integral part of Technavio’s construction portfolio. The construction sector plays a significant role in the progress and development of a country. Technavio covers an extensive range of market research reports on the construction market that cover diverse regions and industry segments and sub-segments, including topics such as mining trucks, professional luminaires, and automatic doors. According to Technavio’s previous report on the global ceramic sanitary ware market, identified Americas as the fastest growing market for ceramic sanitary ware. The ceramic sanitary ware market in the region is driven by the growth in the residential construction sector. Also, construction of new offices, increase in public transportation infrastructure projects, and investments in sports infrastructure are envisaged to fuel the demand for ceramic sanitary ware in the Americas until the end of 2020. Technavio’s new report on the global ceramic sanitary ware market will evaluate the key geographical regions and their behavior over the past four years, introducing new data and observations and providing new predictions. The report is available to order now and will be delivered within one week of purchase. Market research firm Technavio has announced the release of their latest report on the global ceramic sanitary ware market for 2018-2022.